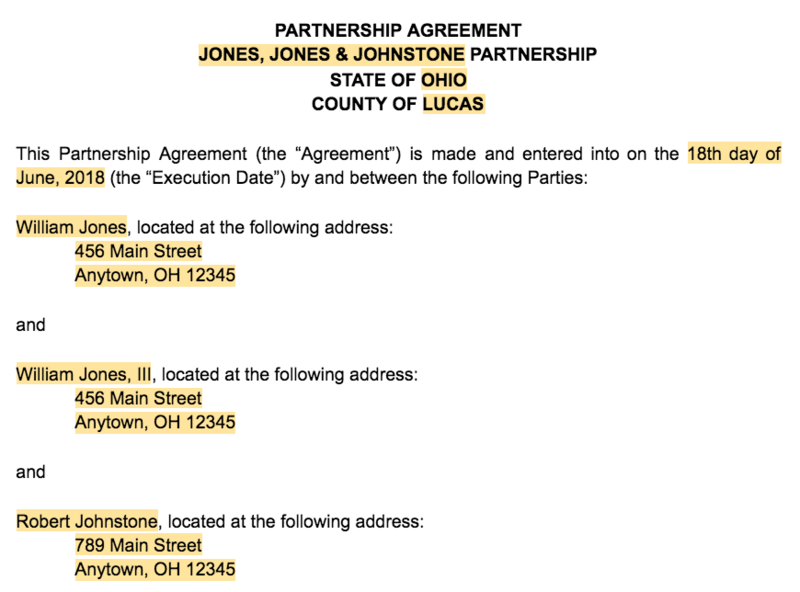 A business partnership agreement is a contract between partners that contains terms like the business’s purpose, partner contributions and voting rights. A partnership agreement isn’t required to form a general partnership and doesn’t have to be filed with your state. However, have your partners sign one to create a legally enforceable document for resolving disputes. Rocket Lawyer offers a state-specific business partnership agreement template, asks you 10 to 15 questions, and then drafts an agreement for you. Click here for a free customizable legal agreement from Rocket Lawyer. We recommend hiring an attorney or online legal service, such as Rocket Lawyer, to prepare important legal documents for your partnership. However, if you’re comfortable drafting your own agreement and want to save on legal fees, download our free general partnership agreement template and follow the steps below to draft a simple partnership agreement for your business. Provide basic details about your business at the beginning of your partnership agreement. 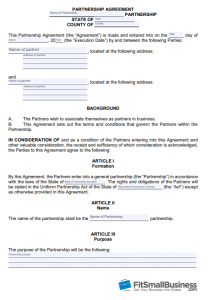 Articles I through V of your partnership agreement should include your partnership’s name, location, purpose and term. General partnerships don’t have to file this information with the state but include it in a signed partnership agreement to keep on file with your business. As a lead-in to Articles I through V, provide the names and addresses of your partners in the first paragraph of your partnership agreement. This information lets the public know that you and your partners are all engaged in business activities together as you fill out the articles together. Your partnership state is the state in which you’ll conduct business. The state you select determines the availability of a fictitious name for your partnership and determines the taxes and laws that will apply to your business. This information will be included in the title of your partnership agreement, in Article I and in various places throughout your agreement. A partnership can be named after its partners or operate under a fictitious business name. 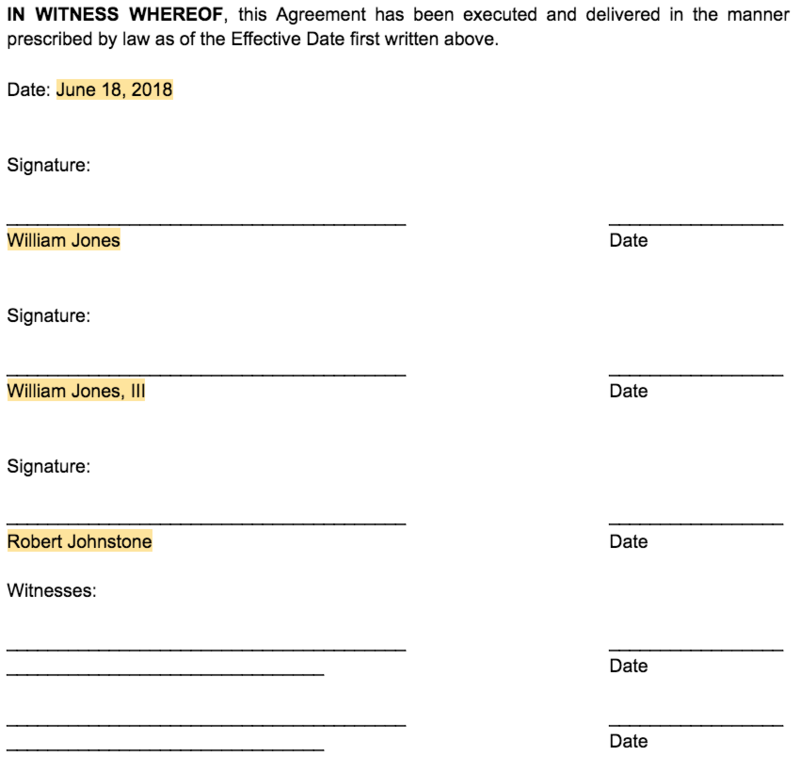 If you choose a fictitious name, confirm it isn’t already in use and fill out a fictitious business name statement to give notice that your partners are operating under the name. Once finalized, include the name in Article II of your partnership agreement. If you need some help choosing a business name, check out our business name generator. States don’t require general partnerships to have a partnership agreement, so your purpose statement doesn’t have to meet any state-specific requirements. However, it should describe the nature of your business and be broad enough to allow for future business growth. Include a general purpose statement in Article III that allows your partnership to evolve without revising the agreement every time your business changes. For example, stating that the purpose of the partnership is to own and develop real property and do all other lawful things as may be necessary to carry on the partnership is general enough to encompass a variety of real estate services and allows for growth. Similarly, if your purpose is conducting the general business of operating a commercial farm and “such other businesses and purposes as the partners may from time to time determine,” you leave your partnership room to evolve. The partnership term is the amount of time the partnership relationship will exist. This period begins when the partnership is formed and can end at any time. Include a starting date and describe when the partnership may end in Article IV of your business partnership agreement. For example, if the partnership was created to handle a single task or project, provide a specific termination date for the partnership. Otherwise, state generally that the partnership will exist until the partners mutually agree to dissolve it, until the death of a partner or until any other circumstance agreed upon by the partners. Your principal place of business is the address where you’ll perform the partnership’s business activities. This should be a street address and not a P.O. Box. Use Article V to set forth your place of business at the time the agreement is executed but allow partners to change the address as necessary during the partnership. For example, if you have a retail store, your principal place of business will be the address of the brick-and-mortar store. In contrast, if you have an e-commerce website, your principal place of business is the address from which your partners and employees are running the website. Our template is a great place to start if your partnership is already formed or if this isn’t your first business. However, if you need extra guidance while you set up your business, let Rocket Lawyer help you compile the necessary information to get your partnership up and running. A Rocket Lawyer membership plan is $39.99 per month and its On Call attorneys can guide you through the process of creating your partnership. A partner’s capital contributions are cash investments, physical property, and other assets like intellectual property they commit to business operations at the outset of the partnership. Capital contributions establish each partner’s equity in the business. 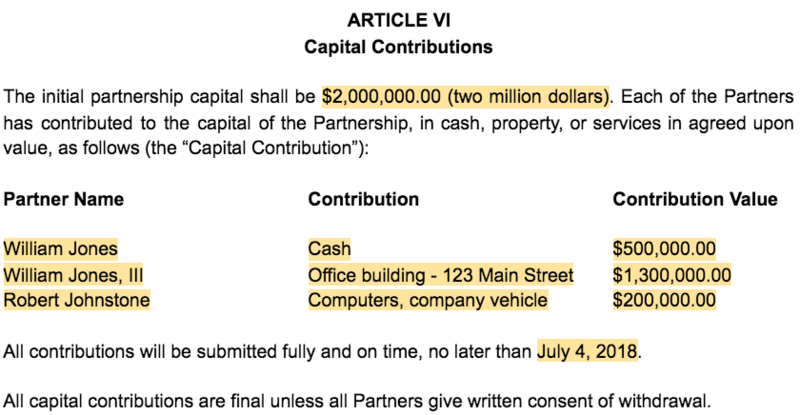 List and describe partner contributions in Article VI of the partnership agreement to establish a record of each partner’s capital account. About half of businesses with employees don’t survive past five years. One of the major causes of a business failing is undercapitalization — partners underestimate how much money they’ll need and how successful they’ll be early in business. Describing the contributions of each partner carefully in Article VI of your partnership agreement will help you better understand your business’ resources. Business ownership can be shared between partners in a way agreed upon by the partners. Often, ownership reflects the size of a partner’s contribution. However, ownership is more complicated if partner contributions aren’t easily valued or where partner roles and responsibilities aren’t equal. Use your partnership agreement to describe how your business ownership will be divided. If you don’t include partner contributions and ownership interests in your partnership agreement, you should list them elsewhere in your partnership’s records and provide them to each partner. An attorney can help identify partner contributions and determine the best ownership structure for your partnership. However, if your partnership contributions only include cash or other easily valued assets, use our template to draft a simple partnership agreement for free. Determining ownership interests can be easy if you’re basing it on each partner’s capital contribution. However, ownership interests can be more difficult to determine if your partners are contributing property or if some of your partners are dedicating time rather than assets. Check out Rocket Lawyer’s monthly membership plan if you need to consult with an attorney about your partnership’s ownership structure. Partners do not receive a salary for their role in a partnership. Instead, profits and losses are typically distributed among the partners in accordance with their ownership interests. Include details about how your business’s profits and losses will be distributed among members in Article VIII of your partnership agreement to avoid financial disputes between partners. Generally, a partnership’s profits and losses are distributed among partners based on each partner’s ownership percentage. If you choose this method, indicate in your partnership agreement that the partners must share in profits and losses in the same proportion as their ownership or capital contributions. A partnership’s voting procedures detail the way partners must vote to make decisions for the partnership. Article IX of your partnership agreement should specifically mention whether there must be a unanimous or majority vote. This section should also describe how much weight each partner’s vote will have. For example, Article IX of your partnership agreement can require that decisions of the partnership be determined by a majority vote with votes cast in the same percentage as capital contributions. Alternatively, you can require a unanimous vote of the partners, give each member’s vote equal weight regardless of their contribution or ownership percentage. Keep an accurate accounting of your partnership’s day-to-day business to maintain a comprehensive understanding of business financials and meet tax requirements. Use Article X of your partnership agreement to describe where the partnership’s books should be kept, when partners should have access to the books and how to report transactions to the partnership. This section should first state where the partnership’s books should be stored — usually at the principal place of business. 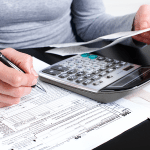 Article X should also state that the accounting records should be available to all of the partners to inspect at any time. Finally, assert that partners have to report all partnership transactions accurately and as soon after the transaction as possible. Businesses change and sometimes this includes adding partners. Because partnerships are structured around the partners, the addition of a partner changes the ownership structure of the business. Even if you don’t anticipate changes to your business, include procedures for adding new partners in Article XI of your agreement. Important information regarding new partners to incorporate into Article XI includes who has the power to add new partners, how to adjust partner responsibilities and how voting will be impacted. If you want the flexibility to add partners later on, allow the agreement to be amended to include new partners pending a unanimous vote of all partners. Your partnership agreement should also describe your management structure and authority of partners to make business decisions. Describe how day-to-day partnership affairs will be managed and identify partner responsibilities and authority to borrow on credit, transfer assets and so on. Include this information in Article XII of your partnership agreement to avoid disputes regarding partners management and authority. It is important to establish what kind of authority partners have to make decisions on behalf of the business at the outset. Describe the powers of partners to manage business activities at the beginning of Article XII. This prevents a partnership from being responsible for the unauthorized actions of its members and ensures that creditors and other third parties understand the authorities of each member to enter into contracts, borrow credit and transfer assets. The day-to-day affairs of partnerships can be managed by a management committee made up of several partners. To form a committee, include terms in your partnership agreement describing how many partners should be on the committee, how they will be selected, and the scope of the committee’s authority. For example, you may choose to have three partners on the committee, chosen by a majority vote of the partners and who have authority to operate all partnership business. Partnership contracts: Generally, a partner with authority to sign contracts on behalf of the partnership can sign a contract that binds all of the partners. Make sure you limit contract authority to partners with knowledge of the businesses needs. Partnership debt: If your business will have a credit card, loan, line of credit or other debts, make sure you specify who may sign for new debts in your partnership agreement. Depending on the business structure that you choose, each partner may be personally liable for any unpaid business debt. Partnership expenditures: If you want to limit expenditures made by partners on behalf of the business, limit who may make purchases without consulting other partners. Alternatively, establish a spending limit on purchases made without permission from other partners. 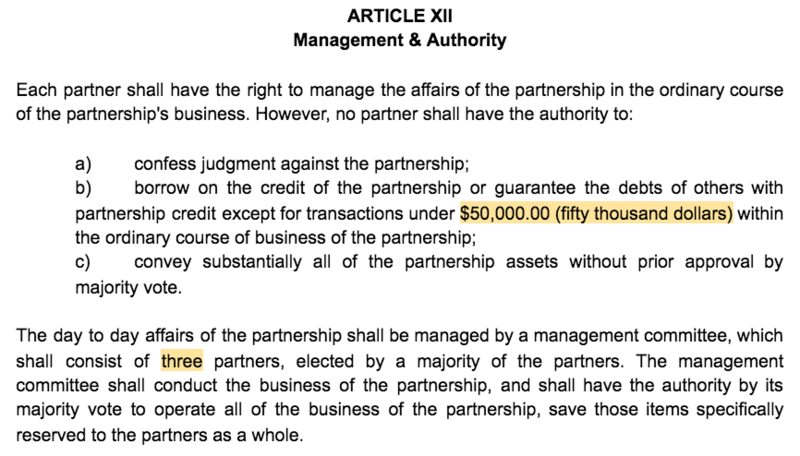 Use Article XII of the partnership agreement to delineate each partner’s authority to sign contracts, open accounts and otherwise commit the partnership to avoid financial and contractual obligations that are not in the best interest of the partnership. For example, limit the amount of money a partner may spend for the business to $50,000 or less to make sure partners aren’t spending large sums of partnership assets on things the partnership doesn’t want or need. If you need help choosing how to manage your partnership or deciding how to limit partner authority, join Rocket Lawyer’s membership plan for $39.99. Its nationwide team of On Call attorneys can help you decide how many partners should manage the business, how to choose managers and more. If there is a partnership agreement in place, a partnership can terminate whenever the partners desire. Use Article XIII of your agreement to specify how your partnership can terminate and describe how partners and partnership assets should be treated upon termination. Include details about whether the business should survive after a partner exits voluntarily or otherwise. In the absence of a partnership agreement, termination of a partnership occurs pursuant to state default rules. Under default rules, a partnership will terminate upon the death or bankruptcy of a partner or under other state-specific circumstances. Control how and when your partnership will terminate by explicitly listing termination events in your partnership agreement. Disputes are an inevitable part of owning a small business. Conflicts between partners are especially dangerous because, left unresolved, they can cause your business to implode from within. Protect your business from by including language in the partnership agreement describing how and where disputes should be resolved between partners. One way to handle partnership disputes is requiring alternative dispute resolution (ADR). ADR uses a third party to reach an agreement between partners without litigation and includes practices like mediation and arbitration. Include terms requiring ADR in your partnership agreement to resolve disputes without the cost, hassle and public exposure that comes with litigation. Other options for dispute resolution include giving the business’ CEO the final say, voting based on ownership percentages, requiring a majority vote for businesses with an odd number of partners or giving a particular partner final say on discrete areas of the business. If you prefer to handle disputes in-house without the help of an ADR specialist, include language in your partnership agreement describing your preferred dispute resolution procedures. Partnership agreement filing requirements depend on your business and your secretary of state’s office. Familiarize yourself with your state’s requirements to determine whether a formal filing is necessary for your partnership. Either way, make sure the partnership agreement is signed by every partner and that each partner receives a copy of the document for their records. Depending on your partnership and business structure, you may need to include additional terms after Articles I through XIV of your partnership agreement. For example, describe partner responsibilities, how to handle new partners or what to expect during a partnership sale. If you have a complex partnership or anticipate changes to your business, include additional terms in your agreement. Generally, partners are involved in different departments of the business. To facilitate efficient organization of partnership roles and responsibilities, list expectations in the partnership agreement. If you want to establish work hours, vacation time allowances or a partner’s ability to work outside of the business, include these details in the partnership agreement as well. Selling a business can be one of the most difficult tasks partners face. Because the sale of a partnership is likely to cause disputes between partners, it’s important to establish transfer procedures. Use your partnership agreement to specify who’ll manage purchase offers, whether partners can force the sale of the business and the minimum business sale price. If you have a complex business or a large number of partners, you may need to include additional sections describing partner responsibilities, how to sell the business or what to do when someone leaves the partnership. Our free partnership agreement template is a great starting point, but check out Rocket Lawyer if you need an agreement that includes additional, more complex terms. A partnership agreement is a legal document that formalizes business operations and creates a contract between partners. General partnership agreements also protect businesses from internal disputes, establish partner responsibilities and more. Your general partnership doesn’t have to file its agreement but keep a signed copy on file in case disputes arise. General partnership: A general partnership is the most basic form of partnership and does not require state filings or other formalities like annual meetings or ongoing state fees. Instead, a general partnership is formed each time partners come together to engage in business activities. This article and free template focus on what you should include in a general partnership agreement. Limited partnership: Limited partnerships (LPs) are typically reserved for finite projects like estate planning. This structure requires filing documents with the state and offers liability protection for its limited partners only. General partners, who oversee day-to-day business activities, have unlimited liability for the acts and debts of the LP. Limited liability partnership: Limited liability partnerships (LLPs) are more complex and can only be formed by certain types of professional businesses that require licensing under state law, like doctors, architects and attorneys. LLPs don’t protect partners from their own malpractice but a partner’s personal assets can’t be used to satisfy the debts of the LLP. Because partnerships are complex legal entities, we recommend hiring an attorney or using an online legal service to help choose a business structure and file it with the state. If you don’t want to spend money to hire an attorney, download our partnership agreement template to get started with a simple partnership agreement today. Partnership agreements are legally binding contracts between business partners. Although not required by state law, even a simple partnership agreement will formalize your partnership’s management structure and protect it from internal disputes. If you have a partnership or an LLP, hire an attorney or use our free template to execute a partnership agreement. Having an enforceable partnership agreement for your business has several benefits. If drafted correctly and signed by all of the partners, a partnership agreement can protect your business from internal disputes and prepare partners for difficult management decisions. Familiarize yourself with the benefits of an enforceable partnership agreement before you start drafting one for your business. States impose default rules on partnerships that don’t have a partnership agreement on file. Under default rules, partnerships terminate under certain circumstances and internal disputes must be resolved using default procedures. Avoid default outcomes by drafting a business partnership agreement describing how profits will be distributed, how the partnership may be terminated and other important procedures. Among other important terms, business partnership agreements describe how partners must vote and who has authority to make decisions for the business. Partnership agreements also include resolution procedures in the event of a conflict between partners. Have dispute avoidance and resolution terms in place to protect your business from failing due to the disagreements between partners. Drafting a business partnership agreement will help you and your partners outline how the business will be structured. By detailing the responsibilities and authority of each partner, a partnership agreement provides clarity and allows the partnership to be operated more efficiently. Include partner responsibilities and expectations within the partnership agreement to lend structure to your business. Transitions can occur in your business if a partner passes away, becomes otherwise incapacitated or chooses to leave the partnership. If you don’t provide for alternatives in your partnership agreement, default state laws will automatically dissolve your partnership upon the death or bankruptcy of a partner. A business partnership agreement can protect your business from internal disputes and other management issues. However, hiring an attorney to draft your agreement can be expensive. A partnership agreement may also restrict partner authority and delay decisions. Use our free partnership agreement template and choose broad language that doesn’t limit your partners’ authority more than necessary. Having an attorney draft legal documents for your business can get expensive. Use our free template to create a simple partnership agreement for your business or check out Rocket Lawyer’s monthly membership plan if you want to consult with an attorney and save money on legal fees. Formalizing your management responsibilities, voting structure, profit distribution and other elements of your partnership can restrict how partners behave. 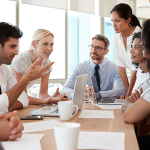 Although this is generally an advantage of having a partnership agreement, it can reduce flexibility in business operations by limiting partner authority and slowing down the decision-making process. General partnerships are formed when two or more partners agree to enter into business together. A formal filing isn’t required to create a simple partnership but you should execute a partnership agreement that formalizes the business structure. Include terms like partner contributions, dispute resolution methods and profit sharing in your agreement to protect you and your business. Depending on your partnership, you may have to meet nuanced state filing requirements. If you need a simple partnership agreement for a general partnership, use our free template to get started. If your business is more complex, hire an attorney or use a legal service like Rocket Lawyer for $39.99 per month to draft the necessary documents. I want to start a new business of Event Management with my two more partners. I need a partnership agreement for three of us to smoothly runs this business , so kindly give the suggestion for agreement please. If our free template doesn’t meet your needs, consider working with a low-cost legal service like Rocket Lawyer or LegalZoom. These often have pre-built templates that they’ll help you customize to meet the specific needs and legal requirements of your business. Best! This website is so informative! Thank you for sharing all of this wisdom to everyone who needs it. Many businesses and government agencies want to keep tabs on your side gigs. Your only option is to contact the HR department at your full-time job and talk to them about what you are and aren’t allowed to do under their policies. I would like to start a new business on partnership for Housing project with partnership agreement , so kindly give the suggest for agreement please. Thanks for reading the article and that’s exciting to hear you want to start a new business partnership for a housing project. I would recommend working with a real estate attorney to establish an LLC where you and your partner are both members and create a partnership agreement in the beginning. This way you know who owns what percentage of the company and what responsibilities you each have and how profits are divided etc. It will outline each of your roles and help prevent future problems. Be sure to include what happens when you sell the property, and a buyout clause in case one of you wants to buy the other one out. Samples of these agreements can be found online to give you an idea of what should be included but in my opinion, it’s worth the money to have an attorney draft a formal document. I have included a helpful article on creating a house flipping business plan that includes a free template and one article on landlord tips in case you’re going to manage the property yourself. Keep visiting our site because we are continuously updating it with fresh content. Let us know how your venture goes too. Thank you sooooo much for this, this was really useful for me. i just finished my partnership agreement thanks to your help. Create a Business Partnership Agreement for FREE! Create a FREE Business Partnership Agreement!